Scott works with a select group of private coaching clients in special situations. He uses a uniquely effective three-step process to help these individuals, businesses, and families achieve exceptional results. Only when a student has a burning desire to learn can a teacher teach him anything. And only when a coaching client has a clear, concise, and compelling objective can a coach help him. The first step of Scott’s process is to ask and answer this simple question: “What’s next for you?” Using a proprietary set of discover tools, he and the prospective coaching client/business/family discern if there is a basis for an engagement. Without a clear, concise, and compelling objective, the engagement does not go forward. 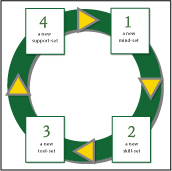 Creating lasting and meaningful change, which is the objective of every coaching engagement, requires that the client acquire four things: 1) a new mind-set; 2) a new skill-set; 3) a new tool-set; and 4) a new support set. With a clear, concise, and compelling answer to the “What’s Next?” question, Scott and the client determine how to satisfy these four requirements for this client and this objective. Each situation is unique; each solution set is customized for that specific client. Using proprietary SunBridge tools, Scott and the client then design a smart, simple, and strategic plan of action for achieving the client’s objectives. This plan of actions starts with a realistic assessment of the current situation and ends with a clear vision of final success. Over the succeeding weeks, months, or quarters, the plan is reinforced, supported, updated, and completed. We have found that high-quality, successful outcomes are virtually assured by this process. If you have an interest in exploring whether a personal coaching relationship with Scott is right for you, please contact SunBridge at admin@sunbridgenetwork.com, or by calling 407-593-2386.